Learn about the tradition of the controversial Hot Cross Bun and how to bake your own with the House of Bread recipe. Tradition binds us together from generation to generation. It allows us to pass down our values and beliefs during special family celebrations. 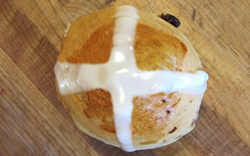 The Hot Cross Bun originated many generations ago in the year 1361 in England, when a monk began making Hot Cross Buns to give to the poor on Good Friday. The dough was marked with a cross to symbolize and remind Christians of the cross that Jesus was killed on. Today, sharing a Hot Cross Bun with another is supposed to ensure friendship throughout the coming year, particularly if "half for you and half for me, between us two, shall goodwill be" is said at the time. Because of the cross on the bun, some say it should be kissed before being eaten. Place the yeast in the warm water and stir just until the yeast dissolves. Add the sugar mixture. Within a few minutes small bubbles will appear. At this point you may add the yeast mixture to the remaining ingredients which you have prepared in a separate bowl. Mix with mixer on low for one minute and then increase the speed to the medium setting for 4-6 minutes. With your bare hand feel the dough, if it is sticky; add a tablespoon of flour at a time. If the dough is tough, mix a couple minutes longer until the dough has reached the right consistency. Cover with a damp towel and let rise in a warm place for approximately 1 and ½ hours or until the dough doubles in bulk. Literally, punch the dough down with your fist. Preheat oven to 350 degrees and spray a flat cookie sheet. Place the dough on a flat floured surface and divide into 4 oz portions. Shape into a roll. Place on cookie sheet. With a serrated knife draw a cross on top of each roll. Brush tops with slightly beaten egg white. Allow to rise for approximately 15 minutes. Bake for 30-35 minutes or until the buns are golden brown. Allow to cool. Pipe a cross into the indention made prior to baking with a combination of powdered sugar, vanilla extract and enough water or milk to make a thick icing.